If you look at a game of Pandemic, it feels a bit like Risk. There’s a map of the world and a bunch of little pieces on it. 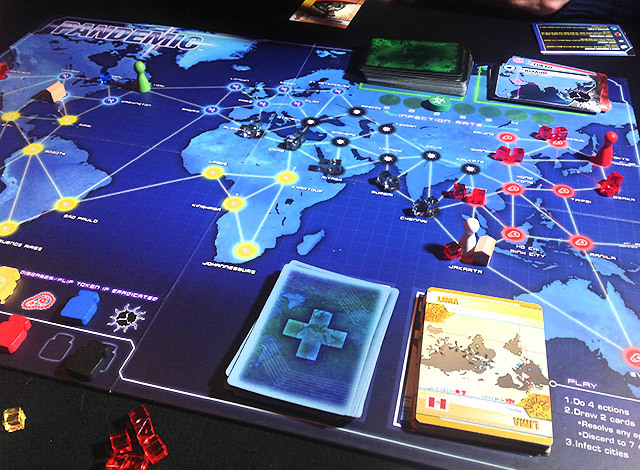 In Pandemic, however, all the players are working together to stop the outbreak of four different diseases. You can do a little bit of disease cleanup by visiting the various cities, but you’ll rapidly fall behind. To cure the disease, you need to collect cards that match the colors of the various diseases. Each player has different skills that are represented by cards dealt at the beginning of the game. You might have special abilities to heal infected cities, cure diseases with fewer cards, or move players around the board. That mix of skills changes with each game. This game is one of the hardest ones I’ve played. It’s a team game and it requires everyone to be playing with the same strategy. You can talk freely but still, it’s hard to keep it all in your head. I love it though! There’s a version for Android where you get to play all the characters and using that, I’ve been able to win a few times on the easy settings.